Now to the swarming Council At-Large race, a fascinating contest with a cast of candidates exceeding the population of several small island nations. In accordance with our prior post on the Executive candidates, let’s review our methodology. First, we calculate total raised and total spent across the entire cycle and not just over the course of one report period. Many candidates, particularly in other races we will discuss, have been campaigning for more than a year and we want to capture that. Second, we separate self-funding from funds raised from others. Self-funding includes money from spouses. Total raised does not include in-kind contributions. Third, for self-financed candidates, we include public matching fund distributions that have been requested but not deposited in raised money and in cash on hand (which we call adjusted cash balance). That gives you a better idea of the true financial position of publicly financed campaigns. And now, on to the financial presentation. (We hope this graphic can fit on your screen.) Two candidates – Brandy Brooks and Darwin Romero – have not filed reports at this writing. Delegate Charles Barkley (D-39) is a big winner here with the largest cash on hand in the race. He has used his unique perch as the House’s point man on liquor issues to raise large amounts of money, adding to a war chest he has been accumulating for twenty years. But the last time Barkley had a competitive election, Facebook did not exist and black and white mailers were still in use. This is a big field full of hungry candidates and Barkley needs to do more than raise alcohol money to win. Council Member Hans Riemer, the only incumbent in the race, continues to excel. He has the highest amount raised ($219,103) and a low burn rate of 11%. Add to that his two terms in office, his experience running countywide, his history of influential endorsements and his campaign skills and he looks like a safe bet to return. Bill Conway has gone from being Diana Conway’s husband to being perhaps the one non-incumbent candidate that his rivals say is most likely to win. Conway’s total raise ($215,881) is almost equal to Riemer’s and he actually collected more than Riemer from individuals. The difference is that he has spent a lot more than Riemer by employing a campaign manager from the early days of his candidacy. But since that campaign manager is former Raskin field staffer Doug Wallick, that was a good decision. Conway combines a MoCo-targeted message of education, transportation and jobs with a likable personality and a staggering ability to learn quickly. So far, so good. The Council At-Large candidates pose for their Class of ’18 picture. 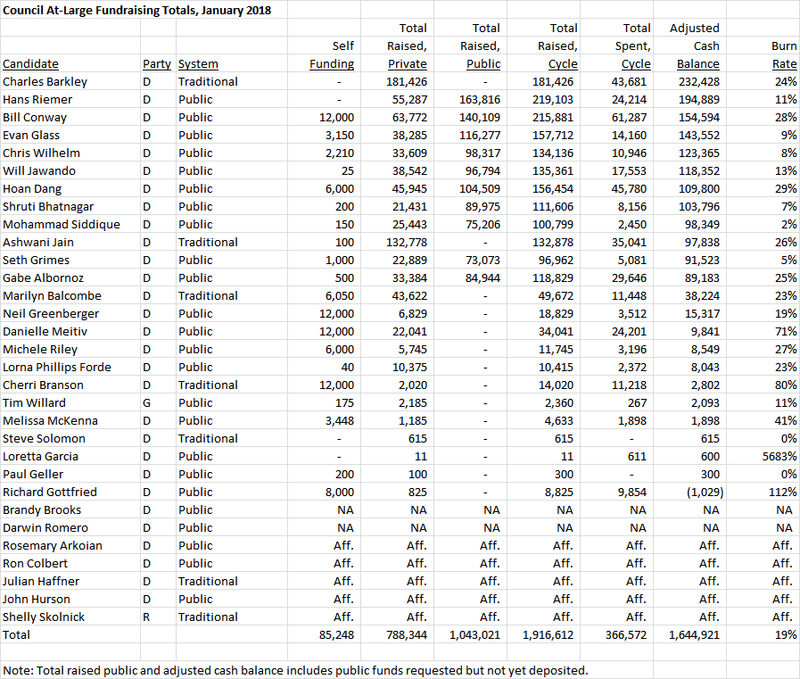 Next come the others who have qualified for public financing, most of whom have done so recently. Evan Glass ran strong in District 5 last time, knows the county well and has a lot of fans from his service on more advisory boards and task forces than your author can count. Chris Wilhelm is a progressive teacher who should appeal to his union, the powerhouse MCEA. Will Jawando is a skilled candidate who would be in the House of Delegates now if it weren’t for Jamie Raskin’s 2014 slate. Gabe Albornoz combines several networks – party, Leggett supporters and folks who have known him from his day job at the Recreation Department – and is liked by basically everyone who meets him. A group of nine candidates – Glass, Wilhelm, Jawando, Albornoz, Hoan Dang, Seth Grimes, Shruti Bhatnagar, Mohammed Siddique and Ashwani Jain – are basically clustered together financially. Danielle Meitiv will be right there too because she is close to qualifying for matching funds. And then there are the rest. 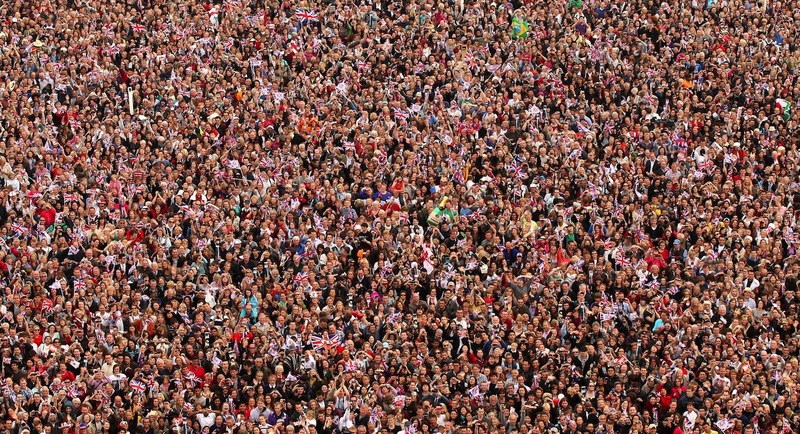 Look folks – it’s popular to say that there are more than 30 candidates in this race. But in all truth, the number of viable candidates is at most half that number. To everyone who filed an affidavit or is not close to qualifying for matching funds: it’s not gonna happen for you, OK? You’re the gazelle trying to run with a pack of hungry cheetahs. You need to show some game or don’t show up at candidate forums asking for your ninety seconds of speaking time along with the folks that are busting their rear ends and getting several hundred residents to contribute. We have a lot of questions about this data, such as: who is giving money? Which candidates are drawing support from specific parts of the county? And why aren’t the female candidates doing better? (Of the top twelve fundraising candidates, only one – Shruti Bhatnagar – is a woman.) All of that analysis will have to wait as we are done for now. Next: the district council candidates. In Part One, we spotlighted five losing candidates who went on to be elected to multiple terms on the Montgomery County Council. That illustrates a key point: candidates with electoral experience often come back stronger in future races, even if they lose their first elections. The top tier of potential at-large council candidates includes the following people who have earned lots of votes in prior races for council and the General Assembly and presumably know how to earn them in the future. Your author admits to being partial to Riemer as a former member of his staff. That said, he is the only incumbent in the race as his three current colleagues have been tossed out by term limits. 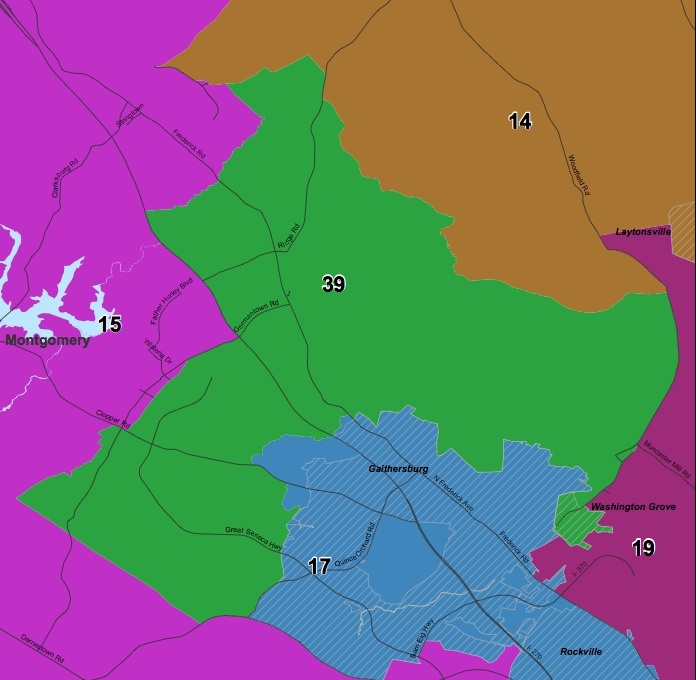 Back in 2010, we ran a series on why MoCo incumbents lose and identified four reasons: they were Republicans, they were lazy, they made lots of enemies (especially in their districts) and they had great challengers. Riemer is not a Republican, he’s not lazy and he has no more enemies than most other local politicians. Great challengers are rare, and because Riemer is the only incumbent running for one of four seats, four great challengers would have to get in to knock him out. That’s just not going to happen. The only certainty in this race is that Riemer will be reelected. Dickerson activist Beth Daly ran a solid at-large campaign in 2014. Her support crossed over with incumbent Marc Elrich and she got many valuable endorsements from the labor and environmental communities. Daly’s problem had less to do with her and more to do with the field as she was running against four incumbents. So did Riemer in 2010, but he benefited from incumbent Duchy Trachtenberg’s blowing up her relationships with labor and sitting on a huge unspent campaign balance. None of the 2014 incumbents committed mistakes of that magnitude, and Daly, despite all the things she did right, could not break through. We don’t know if she has any interest in running again, but if she does, she would be a strong contender in a wide open race. If Hucker stays in District 5, he will be defending a safe seat. Pay no attention to his close victory in 2014; Hucker and his super-duper staff led by MCDCC Chair Dave Kunes have locked down the district. But there are rumors that Hucker could run at-large. If he does, he would be formidable. Hucker has a true-blue progressive voting record in both Rockville and Annapolis, and with more than 20 years of political experience, he knows how to win. Labor and the environmentalists will be there for him, too. Note: it’s misleading to compare the vote totals of Hucker and his 2014 opponent, Evan Glass, to the other candidates on this list. Hucker and Glass ran in a vote-for-one race whereas most of the others ran in multiple-vote races. Former journalist and uber-activist Evan Glass nearly shocked the world by coming close to beating heavy favorite Hucker in 2014. Since then, he has kept busy by running youth film non-profit Gandhi Brigade and serving on Committee for Montgomery’s board. He has well-wishers in many parts of the county’s political community and could be a consensus candidate in whatever election he enters. It’s important to note that Glass and Hucker won’t be in the same race. One will run in District 5 and the other will run at-large. Our prediction: there is a strong possibility that the two former rivals will be council colleagues in December 2018. Former Obama aide Will Jawando is the kind of candidate you could fall in love with. He’s handsome, well-spoken and ridiculously charismatic. He’s also good at raising money. But after running strong for a District 20 House seat in 2014, he inexplicably ran for Congress in 2016. Our prediction is that Delegate Sheila Hixson, who just gave up a committee chair she held for more than twenty years, will retire and Jawando will run for her seat. But if Jawando runs for council at-large instead, he will get more than his fair share of votes. District 39 Delegate Charles Barkley was first elected in 1998 as part of a slate of Democrats who took out three Republican Delegates. He has coasted to victory in the district ever since. Something of a maverick in Annapolis, Barkley has told Bethesda Magazine that he will likely be running for council at-large. Barkley’s problems are that he has never run a modern campaign including social media and blast email and his district has the smallest number of regular Democratic voters of any legislative district in the county. But he reported a $205,478 campaign account balance in January 2017, and if he doesn’t enroll in public financing, he can spend every cent of that in a race for council. That’s the top tier. The second tier is everyone else. There are some noteworthy candidates stepping forward. Chris Wilhelm is a progressive MCPS teacher who has worked for Delegate David Moon (D-20) and is off to a fast start. Marilyn Balcombe, President/CEO of the Gaithersburg-Germantown Chamber of Commerce, is well-known in the business community and is smart and pragmatic. School board members Rebecca Smondrowski and Jill Ortman-Fouse have not publicly said they’re interested in the council – yet – but both of them ran against MCEA-endorsed opponents and won. Would any of them, or any of the many other people thinking about running, be top-notch candidates? There’s no way to tell right now. But given the number of at-large openings and the high probability that some of the top-tier people won’t get in, at least one new candidate will probably win. Delegate Charles Barkley (D-39) has just given the most astounding interview by a member of General Assembly leadership ever seen by your author. In it, he broke the most important rule of Annapolis decorum there is: never throw your superiors under the bus. Barkley is the Chair of the House Economic Matters Committee’s Alcoholic Beverages Subcommittee. In theory, that makes him the proximate point person on alcohol bills in the House. Some think of the alcohol industry as one industry, but in fact it is several, with the manufacturers, distributors, retailers, restaurants and several individual companies hiring their own lobbyists and making tons of political contributions. That makes for complicated politics which, among many other things, has produced the much-criticized bill punishing craft breweries. That bill has already caused one potential brewery owner to bail on the state. “We didn’t know what was in the bill until the day it came in front of our committee for the vote,” Barkley answered. But was that due to the rush of the process, or was it an intentional screen being put up around the bill’s contents? Barkley then paused for a moment. I asked him his thoughts on some of the statements by House members who voted in favor of HB 1283 that they now know it was a bad bill or that they were misled on the contents ahead of the committee vote that pushed HB 1283 over to the Senate. “I would say absolutely they were misled. [The House] thought we worked out a compromise and this was it. We hadn’t,” he stated. Here is a sub-committee chair describing a major bill as a backroom, secret deal involving lobbyists, a powerful committee chair and the Speaker in cahoots to deceive the full House membership. Your author has never seen a state legislator entrusted with leadership responsibility go on the record in this way before. It is an almost certain firing offense. Barkley has always been something of a maverick. Once a Vice-President of the county teachers union, he has not always been their best friend in Annapolis. In 2009, he was famously kicked off the Appropriations Committee and lost a subcommittee chair for defying leadership on the millionaire tax. In 2012, Barkley was one of a handful of MoCo Delegates to vote against the immensely damaging teacher pension shift, a top priority of Governor Martin O’Malley and the presiding officers. After losing the first vote, he introduced a floor amendment to the budget which would have cut the shift in half, which also failed. Considering this record, it’s surprising that Barkley acquired the alcohol subcommittee chair at all. Barkley’s candor is likely aided by his apparent decision to leave Annapolis and run for County Council. We don’t know what the future holds, but we will say this: given Barkley’s iconoclastic ways, he would make an interesting County Council Member.